Global warming has been an issue for many years now. It is often regarded as a long-term challenge. That is certainly true, except that the “long term” is now close at hand, and climate change’s economic impact can already be measured in several major economies. Indeed, the steep volatility in GDP growth rates in some countries is due to exceptional climate events, the number of which has recently risen strikingly. 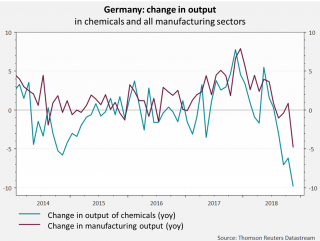 For example, the decline in German manufacturing output in autumn 2018 may be due to last summer’s exceptional weather. Another example is weather’s significant impact on Japanese growth in summer 2018. 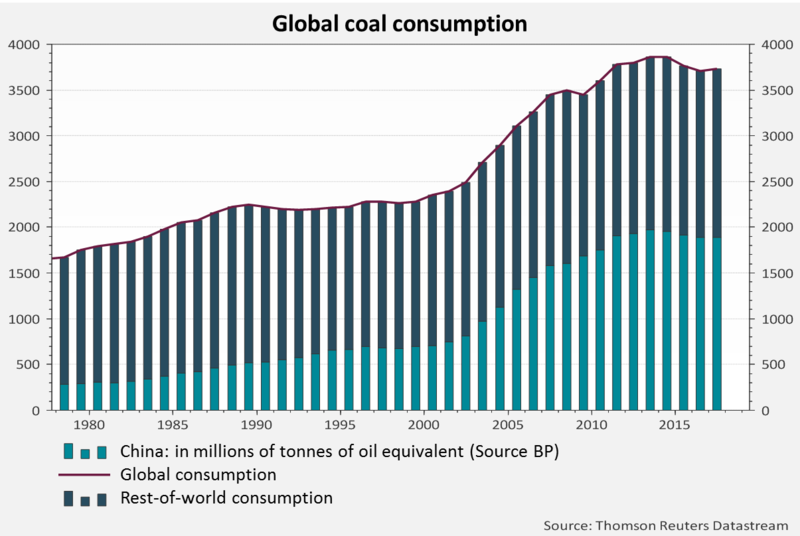 Anthropic global warming has huge consequences, particularly on the development of certain economies and is rushing the transition between two production models, as the latest developments in China have demonstrated. How can climate change’s impact on growth be measured and how could it ultimately affect monetary policies? Climate change’s macroeconomic impact occurs at several levels. The first of these is in direct physical risks, which are caused by the increased frequency and intensity of extreme climate events, which affect the behaviour of economic agents and raise insurance costs. A second level is in liability risks, with the financial impacts of demands for compensation from victims of climate-change-related events. One example here is Pacific Gas and Electric Company, a Californian company that was forced into bankruptcy by massive demands for compensation from victims of California wildfires in the summers of 2017 and 2018. A third level of impacts is the macroeconomic risk incurred from the transition between two production models, which can cause chaotic adjustments in sectors that are big contributors to global warming or that could be rendered unprofitable by restrictions on pollution emissions. Climate change is also likely to affect the prices of goods and services. First of all, it has a direct impact on food prices, but, more broadly, it will also affect growth, along with the allocation of resources, by squeezing countries’ growth potential. Clearly, central bankers will have to keep an eye on the economic fallout of climate change. And monetary policy will have to play its role of fostering a gradual rebalancing in price structures, in accordance with its price stability mandate. Could you provide an example of climate change’s impact on economic growth? The impact of climate change has long been apparent in certain emerging economies and the US. What was new in 2018 is that it hit developed economies that are much closer to us. The clearest illustration of this is Germany, Europe’s largest economy and the world’s fourth-largest. In Germany, 2018 was not only the warmest year since 1881, when regular climate measurements began, but also a year of historically low precipitation during what is usually the rainiest period of the year, between June and November. The lack of precipitation lowered the level of German rivers, the Rhine in particular. This caused a large reduction in river shipping, which accounts for 10% of goods transport in Germany, and increased its cost considerably when there was no easy alternative. This affected several sectors. Automakers experienced severe disruptions in their supply and delivery chains, due to their many production sites along the Rhine. 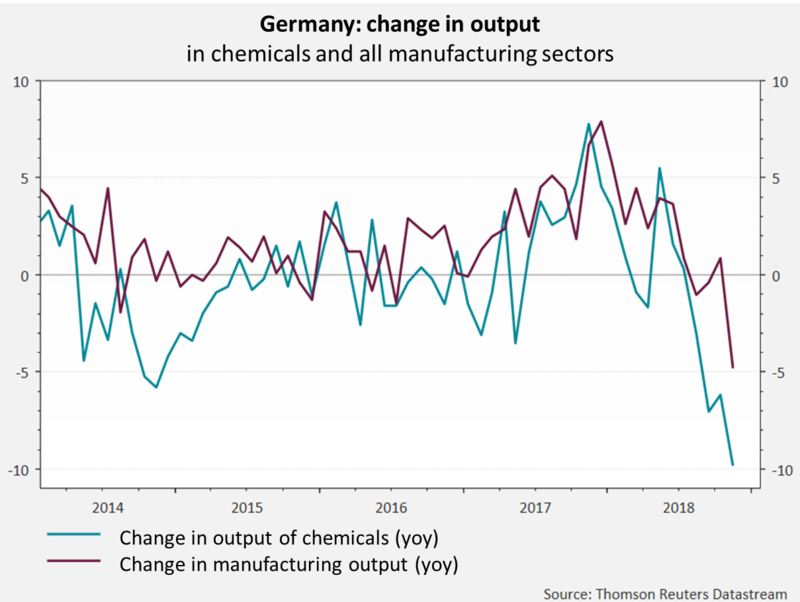 Production of chemicals, which accounts for 8% of German manufacturing sales, was also hit very hard in October and November. Chemicals companies use the Rhine to ship goods, but also to cool their manufacturing facilities. Official restrictions on taking out water for cooling purposes resulted in reduced production or even shutdowns. Hydropower plants were also hit by the Rhine’s low level. The Institute for the World Economy, a German think tank, estimates that all disruptions caused by the low Rhine subtracted 0.2% from GDP in the third quarter and 0.1% in the fourth. This suggests that the German economy would not have contracted in the third quarter, had it not been for these climate effects. On top of the increased volatility of growth figures, keep in mind that climate change will mean that some production and transport infrastructure will have to be overhauled. To what degree could quarterly volatility in Japanese growth be due to climate change? Beyond the usual fluctuations in GDP growth, the third quarter 2018 figure was especially poor and raised many eyebrows, particularly among BoJ members, who said that “climate risk” was becoming a key issue. Japan is often hit by storms and typhoons, but 2018 was an especially harsh year, with 14 events, five of which causes losses in excess of 1 billion dollars. Total losses amounted to $34 billion, equivalent to 0.7 percentage points of GDP. In July, intense rainstorms caused flooding, sudden overflows in riverbanks, and landslides in a number of large cities, including Hiroshima, Kyoto and Osaka. In September, Japan was hit by two tropical storms, Jebi and Trami, causing heavy damage. On top of the cost of climate events, very poor weather had a big impact on household consumption, which fell by 0.2% in the third quarter, even as income increased. Investment spending also dropped, despite a rather strong driven by the run-up to the 2020 Olympic Games. Another notable impact was in foreign trade, which took a heavy hit from the destruction of some harbour and airport facilities in the Osaka region. Exports shrank by 1.4% just in the third quarter, and imports by 0.7%. All in all, GDP declined by 0.7% in the third quarter. This is a significant number, given that the international environment has become somewhat worse since then, keeping the Japanese economy from making up the lost ground in the following quarter. More generally, could some structural economic shifts be due to responses to global warming? We believe that the very rapid transformation of the Chinese economic model is a very striking illustration. Clearly, it was the rapid ageing of the Chinese population that was behind the shift in economic model from one based on exports of low-cost goods to an advanced economy based on services and domestic demand, with a move up the industrial supply chain. 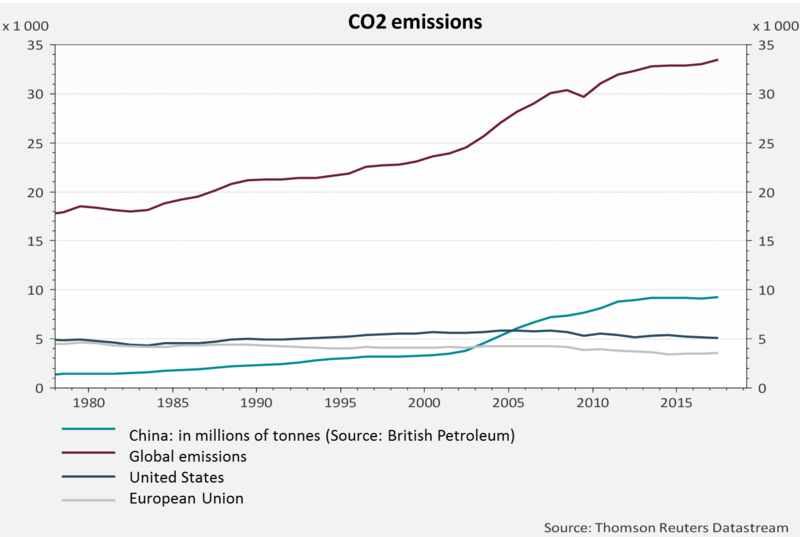 But China’s disastrous environmental record may be another cause. It had been caused by Mao’s isolationist regime’s forced development based on the only energy source available in abundance – coal, of which China holds 21% of the world’s reserves. 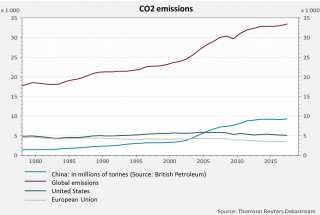 As a result, China is paying a heavy tribute in terms of CO2 emissions and, hence, air pollution, on top of its ground and water pollution. Over the past 40 years, GDP growth has averaged 9.5% and CO2 emissions have risen by 5% annually, hence seven-fold in all. The authorities have begun to take on the issue in response to anti-pollution stirrings in the general population over the past few years. For example, the 13th Five-Year Plan (2016-2020), which is officially called the “New Era” plan, includes green development among its five pillars (along with innovative, coordinated, open, and shared development). This has resulted in economic policy measures, including tax measures, public subsidies, the establishment of special zones, and foreign investments, which have prioritised innovation and development of high-tech, less-energy-intensive sectors over growth in investment in physical capital. This is the “Made in China 2025” strategy. Lastly, some CO2-intensive sectors face major technological changes in meeting climate-change challenges. China has big ambitions in the auto sector, for example, with a goal of banning gasoline-powered vehicles by 2030-2040. In Europe, the European Commission plans to reduce CO2 emissions drastically by 2030, which will require automakers to invest in electric cars or face fines. Whether at the level of governments, companies or sectors, climate change is already looking like a variable with a major economic impact.